S4/158569 Private Bertram Ralph Walker, “K” Supply Company, Army Service Corps died 26 April 1916 and is buried at Manchester Southern Cemetery, Lancashire, England. He was about 22 years old and is commemorated on Cockfield War Memorial. In 1901, the family lived at Main Street, Cockfield where 42 year old John worked as a butcher (own account). Bertram’s 38 year old aunt, Elizabeth Ann (his father’s sister) appears to be living with them at the time of the census. By 1911, 17 year old Bertram and 20 year old Mabel lived with their uncle, Absalom Liddle and his wife Mena and family at 133 Medlock Street, Hulme, Manchester. Absalom was born at Lynesack, County Durham and worked as a pork butcher. Bertram was an apprentice. 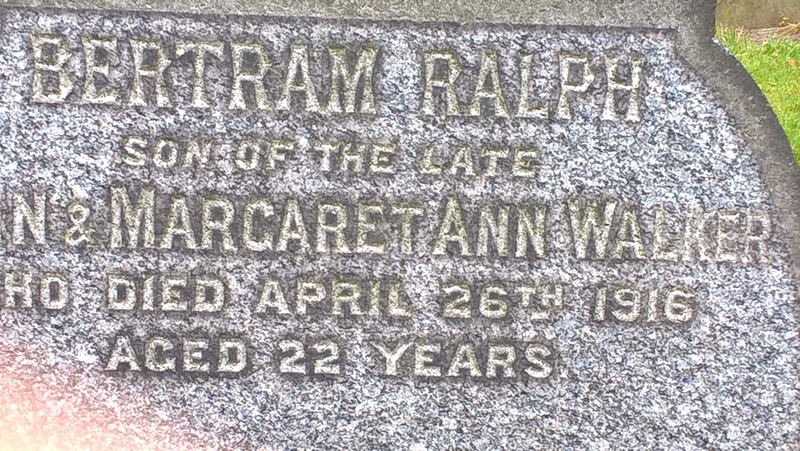 S4/158569 Private Bertram Ralph Walker, “K” Supply Company, Army Service Corps died 26 April 1916. He was the brother of Miss M.A. Walker who lived at Alexandra Park, Manchester. No service details have been traced. It is likely that Private B.R. Walker served as a butcher in “K” Supply Company. It is possible that he died at a Military Hospital in England and was buried “at home” in Manchester. 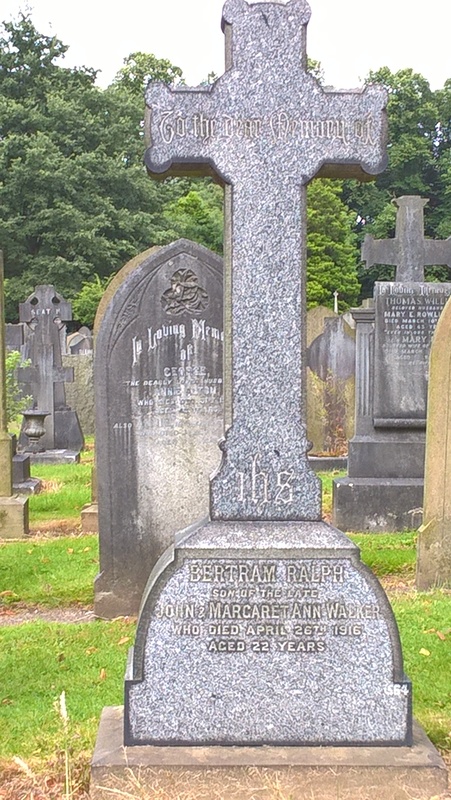 Private Bertram Ralph Walker, “K” Supply Company, Army Service Corps died 26 April 1916 and is buried at Manchester Southern Cemetery, Lancashire, England. Bertram R. Walker is commemorated on the Cockfield War memorial. CWGC & SDGW. Note: SDGW confirms that he was born at Cockfield. England & Wales Death Index 1916-2007 Farnham, Vol.2a p.184 1916 Q2. The Frensham Hill Military Hospital was located near to Farnham in Surrey but “Probate” details record that he died at Cambridge Military Hospital, Aldershot, Hampshire Administration and his effects were left to his sister Mabel Ann Walker, spinster. Thanks to Helen Morton for offering clarification and Ed & Lynn Taylor for the photographs of the headstone in Manchester Southern Cemetery.